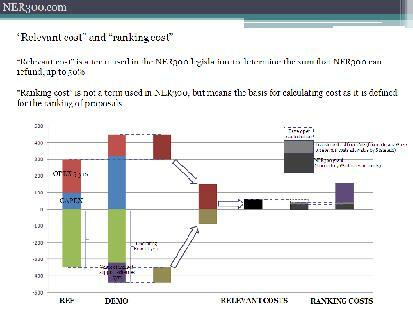 NER300.com » How much subsidy can NER300 provide to a renewable energy project? …where DEMO’s operating benefit, in feed-in tariff markets, is the income from the feed-in tariff and in green certificate or fixed-premium support schemes, is the market price of electricity plus the value of the green certificate or the fixed premium. The operating benefit of REF is the market price of its electricity. For both DEMO and REF operating benefit must also include any income from the sale of by-products, like heat. For the purpose of calculating relevant costs, the NPV of operating costs and benefits for both DEMO and REF must be calculated, while DEMO’s and REF’s investment costs, if incurred over more than one year, are a straight sum of costs in constant prices (Dec 2011 values for the first call, Dec 2013 values for the second call). Guidance is available here. Feed-in tariffs are an “operating aid” within the meaning of the EU’s Guidelines on State Aid for Environmental Protection. NER300 is consistent with these Guidelines’ prescriptions on investment aid although its funding, which is paid out to projects as they produce energy, works like operating aid. Knowing the benchmark “conventional production” price against which a Member State assesses the operating aid it gives to renewables is fundamental to knowing NER300’s potential effect on the economics of a project in that country. This information might not be easy to obtain. NER300 would have most to offer projects that don’t get operating aid, like biofuels projects and the ‘Distributed Renewable Management (smart grid)’ projects (see Annex I A II). Finally, the size of the NER300 pot depends on the price of carbon on the European carbon market at the time the EIB chooses to sell the allowances, which took place (for the first call) at regular intervals between 2 Dec 2011 and 2 Oct 2012. Progress on the growth of the NER300 pot for the first call was tracked in the chart below using data published on the EIB’s NER300 page. “Gross value” refers to the value of the allowances sold. This number is an extrapolation from current trends. “Net value” refers to the range of 1300-1500 M EUR quoted in the EC’s Staff Working Document of 12 July 2012 and equals the gross value after deduction of the EIB’s and carbon market intermediaries’ fees.